1. In a large container, combine marinade ingredients and pork. Marinate inside the fridge overnight. 2. Remove pork from marinade. 1. In a bowl, combine 1/4 cup marinade then mix with 1 tablespoon oil and ketchup for basting. 1. Arrange marinated pork as desired on bamboo skewers then brush with marinade mixture. 2. Repeat the steps for the remaining pieces. 1. Grill pork over hot charcoal for 5 minutes on each side or until tender while basting with marinade mixture. 2. Transfer serving plate and serve with spicy vinegar. Enjoy! 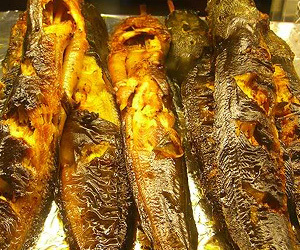 Filipino Style Recipe: grilled eggplant or inihaw na talong is an easy and simple dish that is commonly served as side dish. The eggplants broiled then peeled off the skin and served with sauteed shrimp paste. 1. Broil eggplants until skin are charred and blister. Let it cool. 2. Peel off the skin then transfer to serving plate. 3. Mash lightly the eggplant with a fork then serve with sauteed shrimp paste. 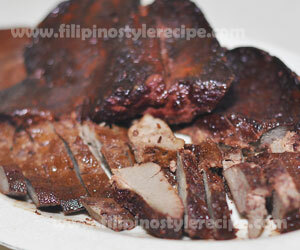 Filipino Style Recipe: grilled pork liver or inihaw na atay ng baboy is another simple yet popular finger-food(pulutan). This is usually made of marinated pork liver(atay) then grill for a few minutes. Serve with soy sauce, calamansi juice and red chili. Pork liver is a good source of protein and iron to helps the body generates healthy red blood cells. 1. In a bowl, combine marinade ingredients then marinate pork liver for at least 3 hour or in a fridge overnight. 1. Remove the pork liver and then reserve the marinade. 2. Combine ketchup and oil in marinade then mix well for basting. 3. Grill marinated pork liver over hot charcoal for 2 minutes each side or until tender while basting with marinade mixture. 4. 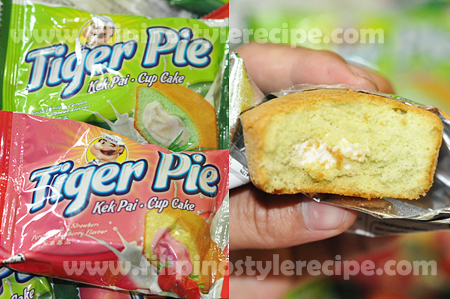 Slice into serving pieces then serve with spicy tuyo-mansi. 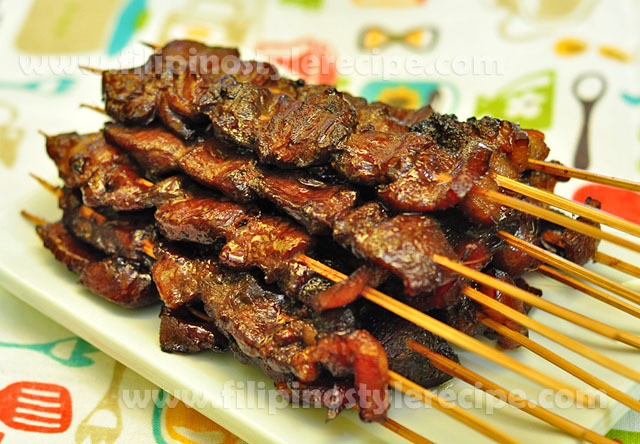 Filipino Style Recipe: grilled pork belly or inihaw na liempo is another simple and popular mouth-watering grilled dish. 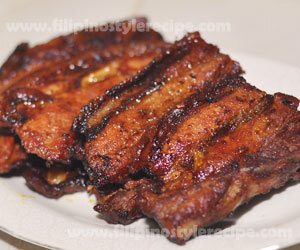 This is usually made of pork belly(liempo) marinated then grilled until done. Serve with soy sauce, calamansi juice and red chili then usually served as finger food or pulutan. 1. In a bowl, combine marinade ingredients then marinate pork belly for at least 3 hour or in a fridge overnight. 1. Remove the pork belly and then reserve the marinade. 3. Grill marinated pork belly over hot charcoal for 10 minutes each side or until tender while basting with marinade mixture. 4. Transfer serving plate and serve with steamed rice and spicy tuyo-mansi. 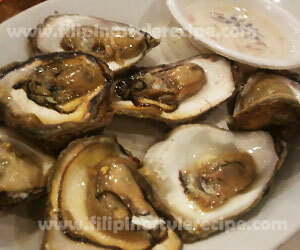 Filipino Style Recipe: grilled oyster is another easy and simple dish made of fresh oysters, grilled until the shells open then serve with white vinegar and bird’s eye chili. 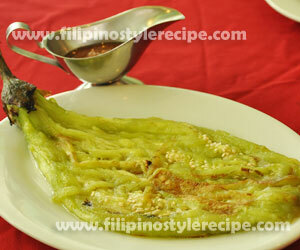 This dish is considered as aphrodisiac and usually served as appetizer or pulutan together with cold beer. 1. Grill fresh oyster over hot charcoal for at least 5 minutes or until the shells open. 2. Remove the oysters from the grill then remove the top shell. 3. Transfer to serving plate and serve with chili vinegar dip. Filipino Style Recipe: Inihaw na hito or grilled catfish is another delicious dish that is favorite by most Filipinos and commonly served as finger food(pulutan). Like other grilled fish, we marinate catfish then grilled over hot charcoal. 1. In a large container, place catfish then add salt and water. Let stand for 10 minutes then rinse. 2. With a sharp knife, slits the catfish vertical cuts on both side. 3. Skew each catfish on bamboo sticks through the mouth. 4. In a large container, combine garlic, soy sauce, salt and pepper then marinate catfish for 20 minutes. 5. Grill marinated catfish over hot charcoal for about 10 minutes each side or until catfish is tender. 6. 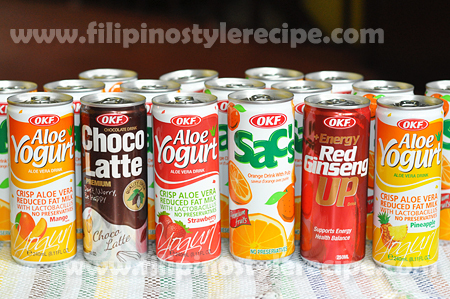 Serve with soy sauce and calamansi. 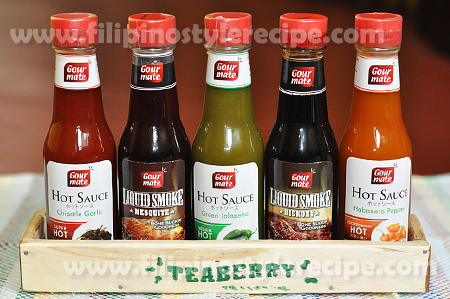 Filipino Style Recipe: chicken barbecue or inihaw na manok is an easy and popular grilled chicken recipe. 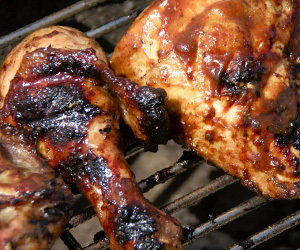 Normally the chicken marinade with seasonings then grilled in a hot charcoal until tender. This is almost similar to chicken inasal. 1. In a large bowl, combine soy sauce, calamansi juice, sugar, bay leaves, garlic, soda, salt and ground pepper. 2. Add chicken, cover and marinate chicken for at least 3 hours or overnight inside the fridge. 1. Remove the chicken and then reserve the marinade. 1. Grill marinated chicken over hot charcoal for 15 to 20 minutes while basting each side with marinade mixture. 2. Transfer serving plate and serve with steamed rice and spicy vinegar. Filipino Style Recipe: pinaputok na tilapia is a grilled/fried stuffed fish, popular on every occasion served as finger food(pulutan). Like Grilled Stuffed Milkfish, tilapia comes grilled or fried with onions and tomatoes inside then wrapped with banana leaves or aluminum foil. 1. Scale and clean the fish. 2. With a sharp knife, slits the fish both side. 3. Rub the skin with salt. Set aside. 1. In a bowl, combine tomatoes, onions, salt and pepper. Mix well. 2. Stuff the mixture inside the fish. 3. Grease the banana leaf with butter then wrap the fish tightly. 4. Grill or fry the fish for about 10 minutes each side or until fish is tender. 5. Serve with soy sauce and calamansi. Filipino Style Recipe: grilled stuffed milkfish or inihaw na bangus is another popular dish in every occasion that usually served as finger food(pulutan). 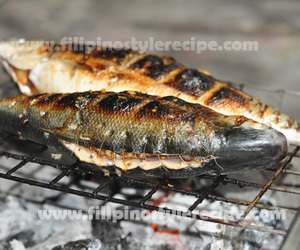 Normally the milkfish is stuffed with onions and tomatoes then grilled in a hot charcoal. You wrap it with banana leaf or aluminum foil. 1. Clean fish but keep the scales intact. 2. With a sharp knife, slice the back of the fish and remove innards. 3. Rub the skin with salt. 4. In a bowl, combine soy sauce, tomatoes, onions, salt and pepper. Mix well. 5. Stuff the mixture inside the fish then secure with thread. 6. Wrap with aluminum foil then grilled over hot charcoal for 15 to 20 minutes on each side. 7. Serve with liquid seasoning.